Upcoming reports on Foreign Direct Investment and Int’l Trade Outlook will be released at the June 17th SELECT LA event, which will draw overseas investors who are traveling onward to Washington DC to hear pitches from many cities in the nation. RELATED: Hear KNX Radio preview the SELECTLA event HERE. INVESTMENT: Summit will look to help L.A. projects pocket foreign money. The second Select LA Investment Summit will start June 17, two days before a national summit hosted by SelectUSA, set up by President Barack Obama in 2011 to assist U.S. economic development organizations in competition for global investments. With 350 attendees expected, the Select LA event aims to draw C-suite executives from Los Angeles and abroad, government officials, and investors from China, South Korea, and Japan. This year, investors from the United Kingdom, Germany, and France will also attend. 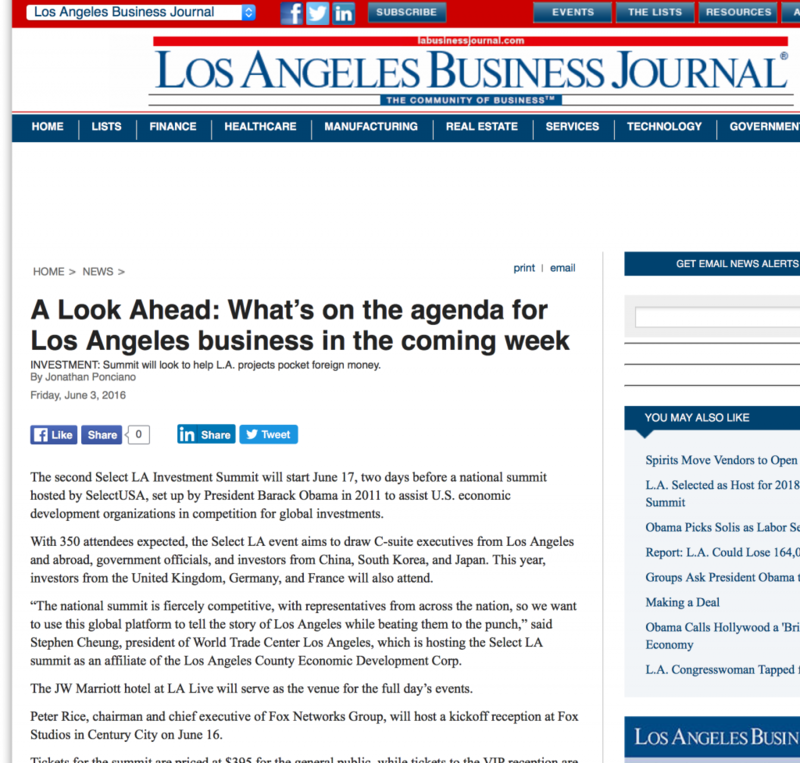 “The national summit is fiercely competitive, with representatives from across the nation, so we want to use this global platform to tell the story of Los Angeles while beating them to the punch,” said Stephen Cheung, president of World Trade Center Los Angeles, which is hosting the Select LA summit as an affiliate of the Los Angeles County Economic Development Corp. The JW Marriott hotel at LA Live will serve as the venue for the full day’s events. Peter Rice, chairman and chief executive of Fox Networks Group, will host a kickoff reception at Fox Studios in Century City on June 16. Tickets for the summit are priced at $395 for the general public, while tickets to the VIP reception are $50. “We’re putting investors in a place where they can network with the movers and shakers already in L.A.,” said Lawren Markle, LAEDC’s director of public relations and marketing. Panels discussing entertainment, technology, real estate, and infrastructure will highlight the sources of major investments coming to Los Angeles. Cheung pointed to the transformation of downtown over the past 20 years as an example of the impact of global investors pouring money into the area. Leading the revival have been real estate investments, including a $1 billion Metropolis project backed by Shanghai-based Greenland Holding Group and $1.3 billion Wilshire Grand Hotel owned by South Korean conglomerate Hanjin Group. “The multiplying effect is going to be tremendous,” Cheung said, adding that other areas in Los Angeles County are seeing a similar influx in developments drawing the interest of global investors. Christine Cooper, LAEDC’s senior vice president, will present research analyzing direct foreign investments in Southern California. She is expected to discuss findings including a count of 9,000 foreign establishments located in Southern California. “This is really the only major event connecting global investors with the local partners here,” Cheung said.